Smaller spaces demand organization. Less square footage means multi-functional rooms and typically, minimal storage. What to do? We are so used to our big attics, garages and basements (which typically get jammed full of stuff we don’t actually need) that we often resist giving them up. When we do downsize we have to change the way we look at our space, minimize clutter and well, think a little outside of the box! 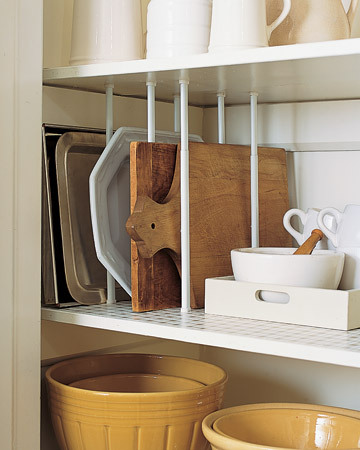 By storing platters and cutting boards vertically you can save valuable shelf space in your pantry. 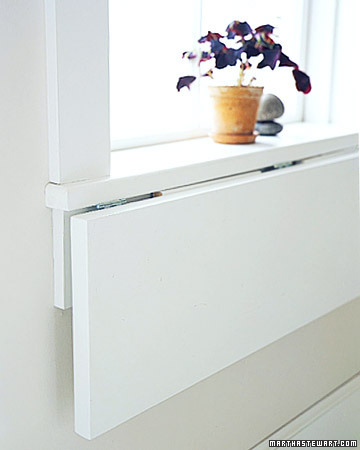 These dividers are simply tension curtain rods! Brilliant! 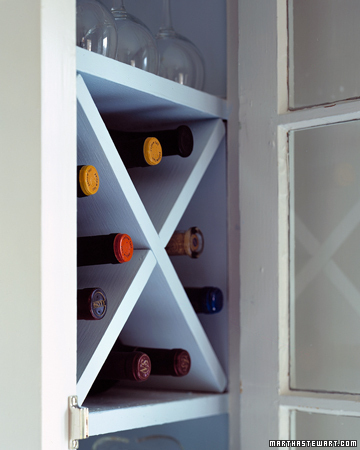 Giving up the wine cellar can be tough but use square cubbyholes like this to house your favorites. Here’s the how to. Counter space a little lean? Consider putting things up on a pretty pedestal to maximize space below. 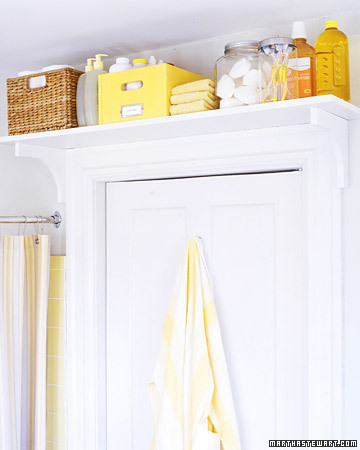 No linen closet in the bathroom? No problem! 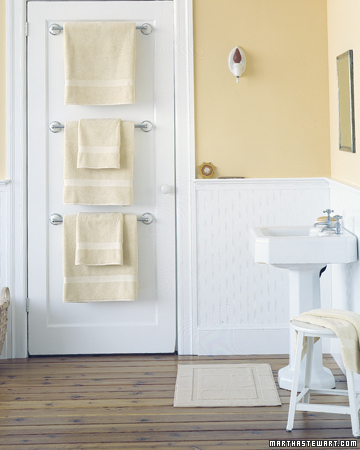 Stacking towel bars vertically allows for ample hanging space. 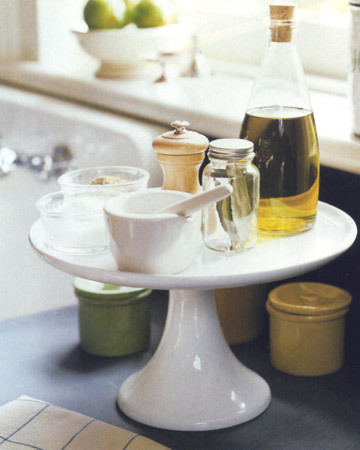 Pedestal sink got you wondering where to store toiletry supplies? Look up. Above the door is a perfect place to install a shelf. Put your products in some pretty containers or coral them in baskets and voila – instant storage! Sometimes a home office is not part of the floor plan in a smaller home but utilizing a quiet corner and a petite secretary might just give you and your laptop a place to work. Double duty dining room! Why not incorporate some storage for your home office into the dining room? Now that table will finally get the use it deserves! Those ugly black file cabinets are so over and they take up far too much valuable space. Convert a bedroom chest into a portable work center. How to here. Don’t overlook a window sill. By adding an extension you can create an additional work, dining or display space. Project info here. These are just a few ideas to get you thinking! 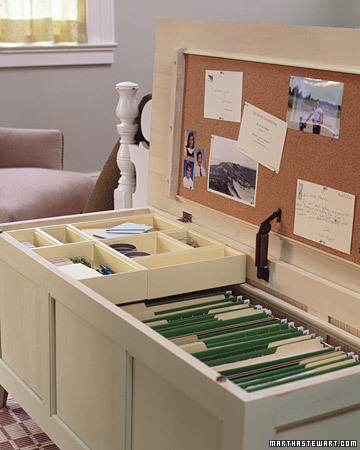 Do you have any fabulous organization or space-saving ideas to share?